Whether you’re a big football fan or not, everyone loves a Superbowl Football Party complete with all the traditional fare including their favorite foods. Let Inspired Catering & Events by Karen and Gina Stefani handle all your Superbowl Catering this year with their Big Game Drop Off packages. This way you get to enjoy the game and food instead of worrying about making and putting out the food. From classic chicken wings to mini burgers to Chicago Deep Dish pizza, we’ve got it all, including a full variety of incredible desserts. Enjoy the game! Let us worry about the food. 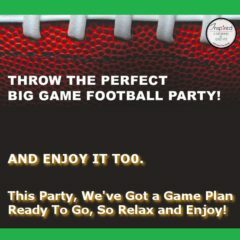 Choose from either First Down, Field Goal or Touch Down menus, and we’ll deliver it right to your party on game day! Packages vary from $12 to $18 per person with a $300 minimum order. Servers are available for just $35 per hour with a four-hour minimum. To ensure on-time delivery, simply place your order 48 hours in advance. This menu will be available from Jan 23 – Feb. 28 2017. Call Inspired Catering & Events today at 312-226-7611.